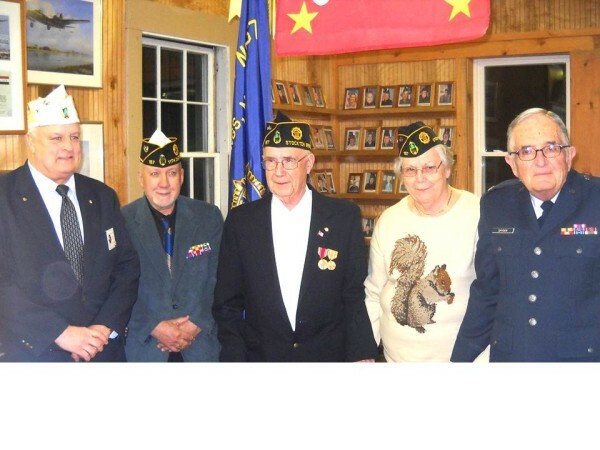 World War II veteran Clarence Littlefield (center) was joined at his medal ceremony in March at the Stockton Springs American Legion Post by Ron Rainfrette (left) Lance Weddell (second from left), Madeline Littlefield (second from right) and Lee Snyder. STOCKTON SPRINGS, Maine — Seventy years ago, Clarence Littlefield lied about his age and left high school early to enlist in the U.S. Army so he could help fight in the last months of World War II. The 17-year-old from Prospect was stationed in the Philippines, where he worked as a truck driver. When he was 18, the war was over, and Littlefield returned home, but something was missing — the medals he had earned during his months serving the country. Eighteen months after starting the process of tracking them down and more than a few decades after leaving the Army, the World War II Victory Medal, the Asiatic-Pacific Campaign Medal and the World War II Honorable Service button have been proudly pinned onto Clarence Littlefield’s lapels. “I’m very happy,” the 87-year-old said Tuesday. Madeline Littlefield, who was a clerk-typist during her Army stint, said that the March 10 medal ceremony at the Stockton Springs American Legion Post 157 was emotional. She said the family contacted the office of Sen. Susan Collins for help in getting the medals. Lee Snyder, a retired colonel in the U.S. Air Force, presided over the medal ceremony. “It’s an honor and a privilege for me,” he said. After the end of the war, Clarence Littlefield went back to high school and got his diploma. He worked nights at the fertilizer plant in Searsport and took care of his aging grandmother, who had raised him, during the day. He married Madeline Littlefield in 1955, when she was home on leave, and they will celebrate their 60th anniversary this fall. “You both have to work at it,” she said of their secret to a long marriage. She also had positive words to share about serving in the military.